After 43 years and 12 consecutive majority governments, it appears that Albertans may well be sending the Progressive Conservative Association to the showers. 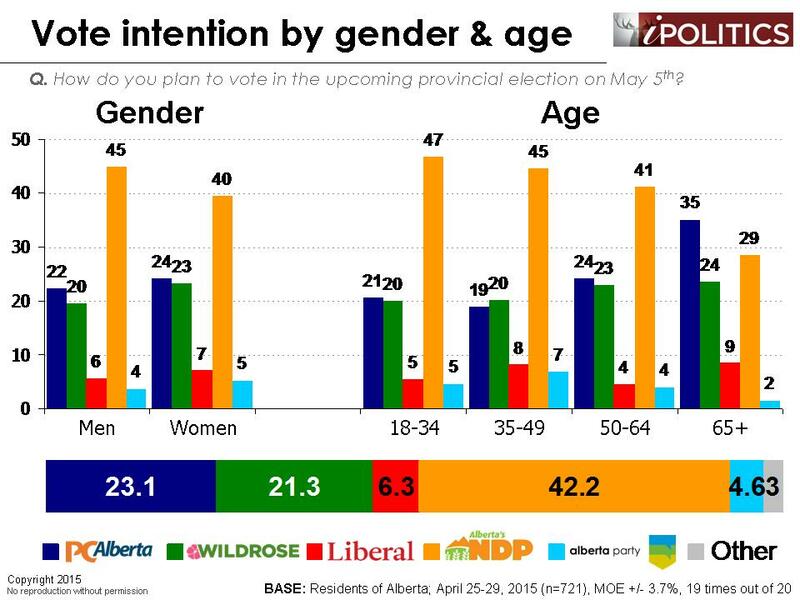 Indeed, with these figures, the NDP is not only on track to win, but they may well be headed to a majority. An important point to note, however, is that the Alberta NDP relies heavily on younger voters, who have a long history of poor turnout. 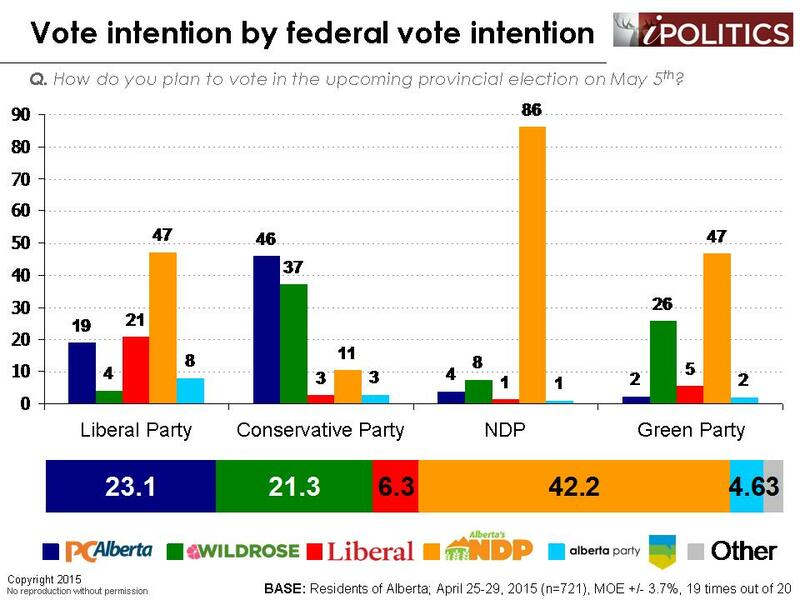 Therefore, the Alberta NDP’s biggest challenge will be ensuring their supporters actually get out and vote. Nevertheless, it is difficult to envision a scenario where differing turnout rates would lead to a 19-point-plus turnaround. Assembly of the vast majority of the centre-left vote. The NDP owes their success to their ability to unite progressive voters across the province. Federal Liberal, NDP, and Green Party supporters have all rallied around the Alberta NDP banner. Could this election be a test of the mettle of the progressive vote? A split right. In an exquisite juxtaposition of the federal scene, conservative voters are split between hard- and light-right (the federal Conservative Party obviously doesn’t face this handicap). Revenge of the latte-sipping elites. 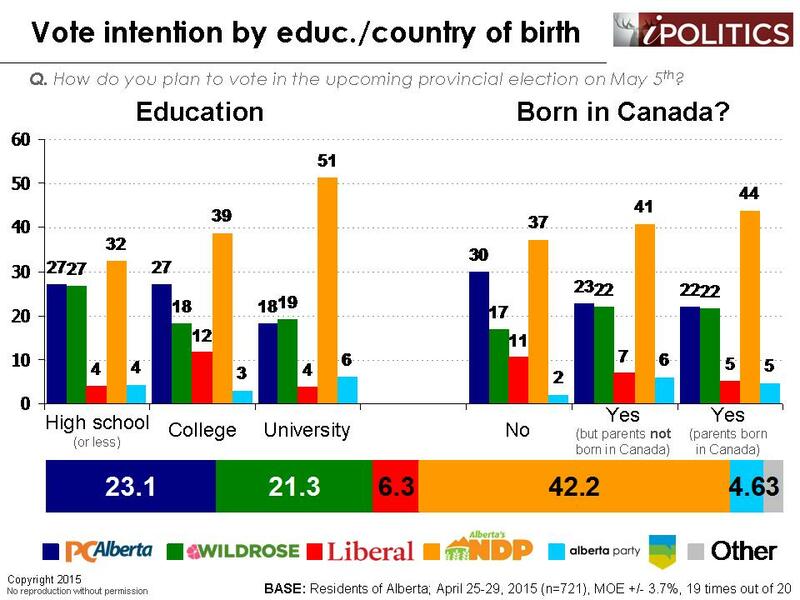 The Alberta NDP is largely being propelled by huge and unprecedented lead with the university educated. Indeed, at 51 points, they out-perform both the Wildrose Party and the Progressive Conservative Association by a margin of more than 30 points. Power of labour. 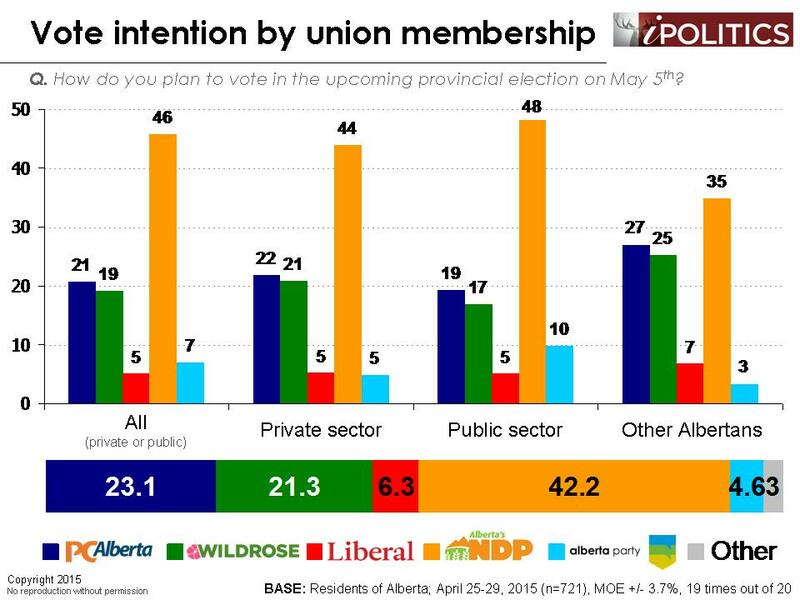 The NDP also holds 2-to-1 advantage with union members (both current and former). Outside of this base, the race is much narrower. 3.) NDP rise linked to middle class angst and stagnation? The NDP’s success is being propelled by much more than dissatisfaction with Alberta’s current government. Rather, these results reflect a rapid, underlying transformation. Anxious about middle class stagnation (47% of Albertans select restoring middle class progress as their most important election issue), Albertans appear fatigued with the not-so-neo-conservative model of austerity and trickle-down economics, instead favouring a shift from staples and extraction to innovation and, as the NDP leader describes it, “value-added” economics. The field dates for this survey are April 25-29, 2015. In total, a random sample of 721 Alberta residents aged 18 and over responded to the survey. The margin of error associated with the total sample is +/-3.7 percentage points, 19 times out of 20. 3 comments to Orange Chinook! Holy Orange Crush, Batman! Who woulda thunk it? Alberta has a history of sudden regime changes coming out of nowhere beginning with the United Farmers of Alberta overthrowing the Grits. Then came Social Credit (and Bible Bill believed Major Douglas’s nostrums), only to be ditched by the PC’s whose dynasty commenced in 1971. Despite its right wing image, Alberta governments have frequently had the highest per-capita social expenditures in Canada, a hidden social solidarity has perhaps being made manifest in the NDP onslaught from nowhere. Alberta and Quebec share this penchant for sudden dynastic changes, and the history of both provinces could be delineated, like China’s, into dynasties. Quebec and Alberta also share the taste for asserting provincial jurisdiction. I was an Alison Redford fan but perhaps a human rights lawyer was a step too far for Tories. I mean, who really cares that Redford took her kids to Mandela’s funeral. Comment Part 2 Why do plepoe leave ? 30% of the plepoe that lived here in 2001 left by 2006 ! So before you start growing as a community you have to attract 30% or 3600 plepoe. This is very transient,however not uncommon. Wetaskiwin must change focus and hire and elect young plepoe with young refreshing ideas that don’t include baggage. “Young” means under 30. While leaders are typically older we need the “young” plepoe to step up to the plate and lead this community into the future with a new focus. Look for non typical jobs for the “creative class” of young educated plepoe. Someone who is going to carry the community to the future. They will be 40 soon enough.! I look forward to comments on this.